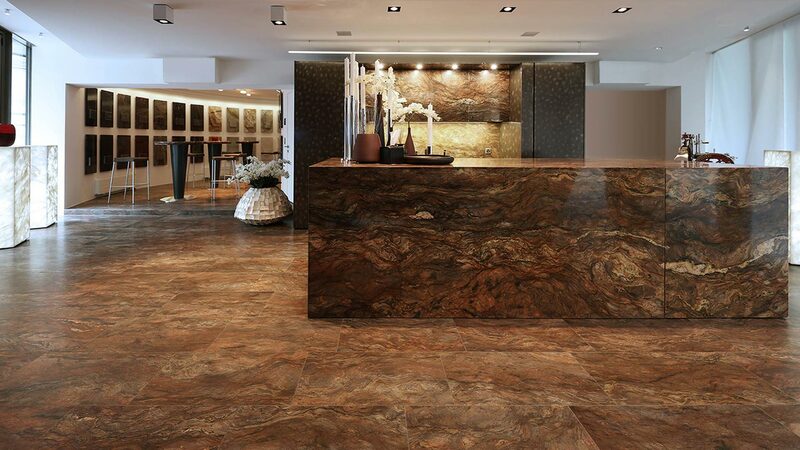 Quartzite and Peltrox®: the alternate use of the two materials provides perfect stylistic balance to the kitchen. In this stone kitchen with island the masterly combination of primordial materials, like quartzite and pewter, valorised by an essential design language and the integration of advanced technologies, this is Quinto Elemento by TM Italia. The kitchen features Peltrox® metal and Fusion Wow stone surfaces, two materials which create an intense dialogue. 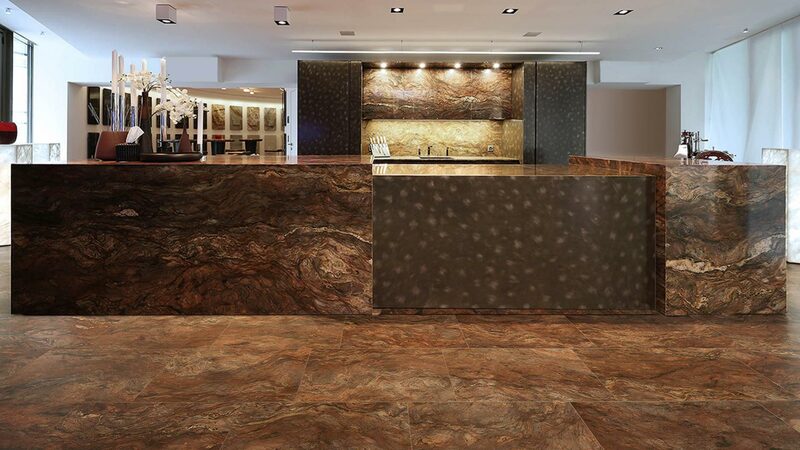 The stained finish of the Peltrox® — a metal combining the performance of modern stainless steel and the appearance of a thousand-year-old material like pewter — perfectly combines with the expressiveness of the natural stone texture, which is rich in tones and shades ranging from reddish brown to anthracite grey. The intriguing visual tension that arises from this combination is emphasized by the formal composition of the kitchen, built out of two monolithic volumes: a wall of six column with recessed doors and a working island. In the first instance, the Peltrox® frames the central recess which is coated internally in stone. In the second instance, it is the stone that hides a Peltrox® heart. 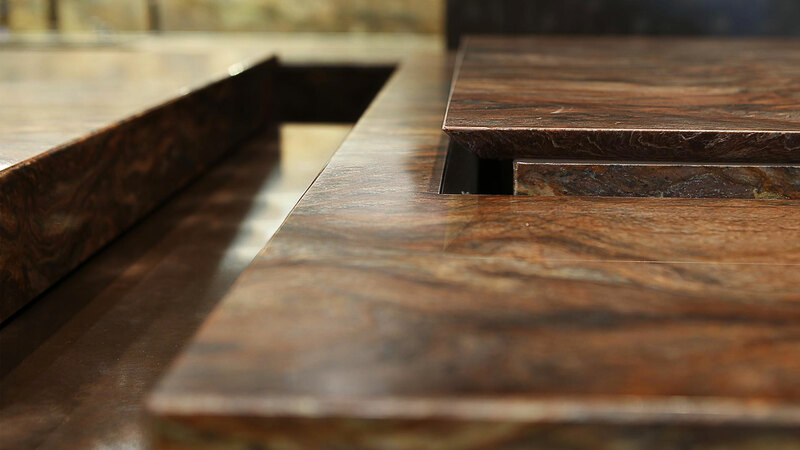 When closed, in fact, the working island is evenly covered in Fusion Wow stone. When opened to uncover the stovetop, it reveals its metal core. When closed, the column volume of TM Italia’s Quinto Elemento kitchen appears evenly coated in Peltrox® with a stained finish. Opening the four central disappearing doors, the kitchen unveils a niche covered in Fusion Wow stone, with a bench top and cabinets. The lower modules house the dishwasher and waste bins. The sink is integrated into the top while the cabinets provide precious space for food and dishes. The stone cladding is made from a single block so as to keep the continuity of the surface veins intact. A stylistic detail valorising the aesthetic qualities of precious materials such as this quartzite. The lateral two columns integrate two ovens for conventional and steam baking and the combined refrigerator and freezer have been positioned on its ends. 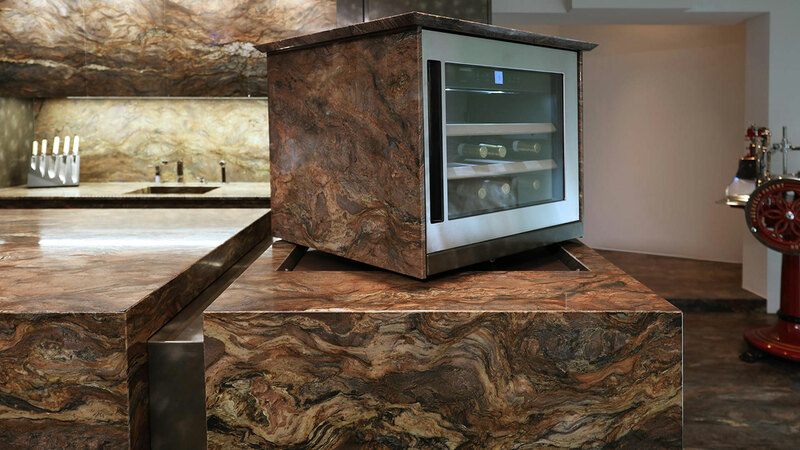 The island volume of TM Italia’s Quinto Elemento kitchen looks, when closed, like a monolith of Fusion Wow stone. Apparently simple, the island is equipped with remote controlled, servo-assisted automation which, within a few seconds, unveils the kitchen’s functional zones. Incorporated into its side, beneath a very thin stone coating, is a wine cooler which, by means of a servo-assisted mechanism, emerges upwards, where it can be rotated up to 330° to facilitate access. 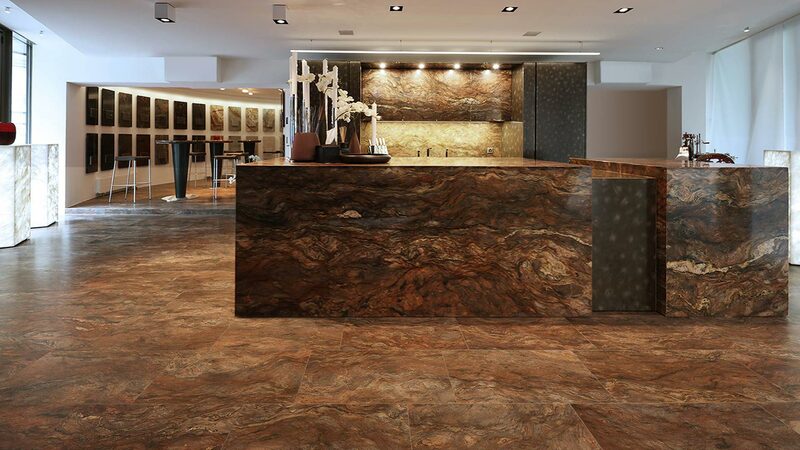 To allow self-centring and the perfect reinsertion of the cooler into the top, the edges of the upper coating of the stone, which are 20mm thick, have been chamfered at 45°. The main part of the island volume can be slide laterally by means of a solid end silently moving structure specifically developed by TM Italia. Once the stone surface has opened up, the the Peltrox® metal bench top emerges, revealing the integrated induction hob. The cabinets below host baskets and drawers that can be opened electronically in a push and-pull mode and are internally lit with self-activating LEDs. Internal structure: tobacco stained rift-sawn oak.